Tiger-Heli was one of the first games developed by Toaplan (a now defunct Japanese arcade game developer) and published by Taito Corporation in 1985. It is a predecessor to Twin Cobra. The player controls a helicopter named Tiger-Heli taking out land-based enemies along the way. The game is a vertical scrolling shooter where the player controls a helicopter taking on hordes of enemies which include tanks, battleships, and artillery. Besides some airplanes taking off, there are no flying enemies in the entire game. The player's main weapon is an unlimited supply of missiles which travel a max distance of half the screen's height. The player also has two bombs which destroy all objects within a large circular radius. These bombs can be blown off by enemy bullets. The player is killed after only one hit, and is re-spawned to a point approximately one whole vertical screen-length previous. The player is given three lives initially and bonus lives are awarded at 20000 points and every 80000 points thereafter. Flashing crosses scattered throughout each level award players powerups depending on which color the cross is. A red cross will gives the player one side-firing mini-heli which shoots perpendicular to the player's helicopter. A white cross yields a forward firing mini-heli. It is possible to have a mix and match of side-helis, totalling no more than two. The green cross will award the player with an additional bomb, if the player currently has less than two. Grabbing powerups when not necessary yields 5000 points. Tiger-Heli was the first game to introduce the concept of the Mega-Bomb. There are a total of four stages, all of which start and end with a helipad. After completion of the last stage, the game will restart in a more difficult mode starting on stage 2. Tiger-Heli was distributed in American arcades by Romstar. 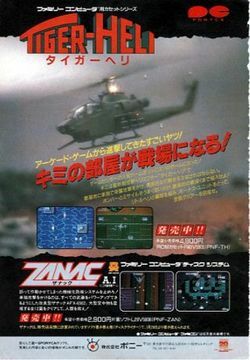 Tiger-Heli was developed for the Famicom by Micronics and published by Pony Canyon (who also published Compile's Zanac only a few days earlier) in 1986. This port was localized for NES markets outside of Japan by Acclaim. The game was also published for the Sharp X68000 in a near pixel-perfect conversion. Joystick: Use the joystick to guide the Tiger-Heli throughout the game. You can move the helicopter throughout any portion of the lower half of the screen. The background automatically scrolls independent of your motion. Guns: Tap the gun button to fire the Tiger-Heli's primary weapon; an array of four guns lined up along the helicopter. You can hold the gun button down for automatic fire, but the guns will not fire quite as fast as they would if you tap the button rapidly. Mega Bomb: The Tiger-Heli can store up to two Mega-Bombs beneath its carriage. When you press the Mega Bomb button, you will deploy one of the bombs, and it will hit the ground and explode with tremendous force. Any enemy caught in the blast radius will be instantly destroyed. Sometimes if you are hit by a bullet, you may deploy a bomb instead of losing a life. These bonus tiles can be found occasionally throughout the game. They are not constantly visible, but rather rise up and down periodically. If they are not destroyed after their third appearance, they disappear for good. Shoot them to collect them. An indicator in the bottom left corner of the screen keeps track of how many you have accumulated so far. If you collect ten of them, you will earn an extra life. Crosses are the one and only opportunity that you get to power the Tiger-Heli up. Crosses cycle through three different colors; red, white, and blue (aqua). The color that a cross is when it is shot determines which power-up you will be offered. You can only possess up to two different power-ups at a time. Refer to the chart below. Red Side-gun copter A small red helicopter will join you at one of your flanks. Every time that you fire your main guns, the red copter will fire to the side. It can be destroyed independently of the Tiger-Heli. White Fore-gun copter A small gray helicopter will join you at one of your flanks. Every time that you fire your main guns, the gray copter will also fire forward. It can be destroyed independently of the Tiger-Heli. Blue Mega Bomb A bomb icon will appear. If you collect it, you will gain an extra Mega Bomb. You can only possess two Mega Bombs at one time, so collecting a bomb icon will not give you a third. Cross (red/white) 3000 when you have two little copters. Cross (blue) 3000 when you have two bombs. The first extra life is awarded at 20000. Each new extra life is awarded every 80000 points beyond 20000. 10,000 Points Bonus: At the start of the game, count your shots until arriving at the first railroad. If you've counted every 16 shots (16, 32, 48, 64 ...), a little car should enter the screen on the right side. Destroy it with next shot to get a 10,000 points bonus. There are similar cars throughout the game, but making them appear is a mystery. 2nd 10,000 Points Bonus: Near the beginning there is a 'school house' with a red drum on the top. If you hit the red drum enough times, you'll get a 10,000 points bonus. Second Chance: If you get shot soon after starting a new game, the game will often let you off and just fire a super bomb instead. Warp: Lose your first player without scoring any points (make sure the second chance super bomb doesn't hit anything). The game puts you forward to a railway where a car will appear that can be shot for 10,000 points. Hint: Blast everything. Civilian cars and houses, etc., all give 50 points each. Continue on the NES: Press + on the Game Over screen. What follows is the layout of each of the four different stages, broken up into 8 sections.